The student will demonstrate his/her receptive language labeling abilities by finding the card that corresponds with the word spoken by the teacher. 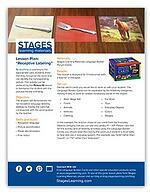 Stages Learning Materials Language Builder Picture Cards. When your student is ready for distractor cards, cards #348, 349, and 350 have been left blank to be used for this purpose. Distractor words are the other words (not the target) that you put on the table from which your student will be able to choose. When your student is ready to move beyond blank distractor cards, any other image card may be used as a distractor, as long as a distractor image is not the same as your target! (For example, if your target word is apple you don’t want to use a different apple card as a distractor. Sit with your student at a desk or table so that you can easily see your student and interact with the cards on the table. Depending on the student, you may choose to sit next to or across from him or her for best results. Have both blank and picture distractor cards ready. Place a card on the table facing the student (for example, #255, the plate). Ask your student to give you, or to touch, the card in question. When your student either gives you or touches the card, you know that he or she has received and understood the word. Try this activity again with the same card to ensure the student understands the activity. 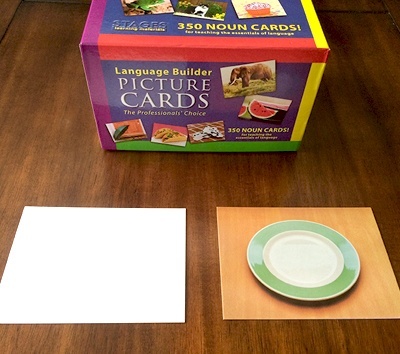 Move on to other target words (for example, the bowl, knife, and fork) and complete the same activity with the new cards. Place a card on the table, (for example, #255, the plate) along with a blank distractor card (cards # 348, 349, and 350 are blank for this purpose.) Both cards should be facing your student. Ask your student to give you, or to touch, the target card. Try this activity several times while changing the position of the target card and distractor card. For example, if the target card is on the right, put it on the left next time. Or put the cards on top of each other. When your student either gives you or touches the target card, regardless of its position, you can feel even more confident that he or she has received and understood the word. 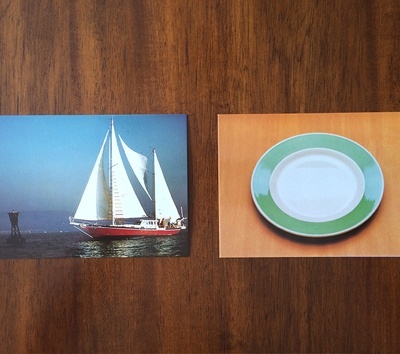 Place a card on the table, (for example, #255, the plate) along with another picture card (for example, #203, the boat). Both cards should be facing your student. Ask your student to give you, or touch, the target card. Try a phrase like, “Give me the plate” or “Touch the plate”. Your student now has to distinguish the plate from the boat. When your student either gives you or touches the target card, you know that he or she has received and understood the word. Also try changing the picture of the distractor word a few times. For example, use the picture of the boat, then switch to the picture of the chicken. Start with only one other distractor picture card on the table, then increase the number of other cards so your student will have to carefully study all of the cards before selecting the horse.